This is part of the How to Big Wall Climb SuperTopo book. Videos like the ones above illustrate key points of the book and are meant to be watched while reading the book. Buy the book here or just read this free sample of the text below with photos. Chris McNamara on The Shield, El Capitan. I have some exciting news: you know all that gear you have been placing over the years on trad climbs? If you were like me, you were probably climbing within your ability and not taking lots of whippers. So you never REALLY knew how good those gear placements were. Well, today you get to find help. Today you will stand, bounce, and bounce even harder on that gear. You finally get to rely on all that stuff you have been hauling around over the years. • Efficient gear racking and organize, organize, organize. • Bounce test harder than you think. • Try to find the worst possible cam and stopper placement that will still hold your weight. • Nuts, daisy chains, fifi hook, free biners, gear sling or shoulder-length runners, draws, slings, helmet. • New gear you have earned: cams, nuts, offset nuts. • Optional gear: gloves, self-belay device. A 30 to 60-foot crack climb at a 80-degree angle is ideal. However, almost any climb works. My first aid climb was a 30-foot sport climb where I could place tiny stoppers in a seam but still clip bolts to make sure I didn’t hit the deck if I fell. Start on top rope so there is no fear of falling. Try as many aid placements as possible. Fiddle around with nuts and cams in as many different ways as possible. Sketchy placements that you would never dare place on a free climb can make suitable aid placements. You will be amazed at what will hold body weight. 1) For mostly-free walls like The Nose or Salathé, I use a single gear sling. Each cam gets its own biner. Similar sized cams are clipped to each other; stoppers up front. I clip quickdraws in pairs to the harness. Free biners are clipped in groups of five or seven. Lightweight shoulder-length runners go over the opposite shoulder. 2) For mostly-aid routes with a bigger rack I use a double gear sling (I don’t like the multi-loop single or double gear slings). On the right side I clip all the cams with the smallest in the front. Each size cam is on one biner clipped at the plastic-coated loop (not the short sewn runner if it has one). Stoppers go to the front. All the biners and draws go on the left side. I clip the should-length runners to the left side of the harness to one biner. Always keep the rack organized. This may seem obvious but on a big wall there is so much gear and logistics that it is easy to get sloppy and not keep things organized. Spend the extra time organizing. Every minute spent organizing saves two more more minutes on lead. It is especially important to have an organized rack when free climbing so you get the right piece fast and don’t hang out, search around, and lose strength. Also, if it’s a gear-intensive pitch where you will need to ration gear, you want to look down and instantly know what gear you still have at hand. Efficient aid climbing is all about reach from one placement to the next. When you have a big reach you have a larger area from which to choose the next good placement. More importantly, the bigger your reach the fewer placements you need per pitch. Even when efficiently aid climbing, each placement will take one to two minutes to deal with. Make 25 placements on a pitch instead of 35 and you save 10 to 20 minutes per pitch. Multiplied by 30 pitches, that is five to ten hours. Also, when you reach farther and leave less gear you will have more options for gear placements high on the pitch. There is nothing worse than using all your good pieces down low and then having to improvise crappy placements up high. Short people take heart—reach is only partially a function of how tall you are. It is mainly a function of how high you were standing on your last piece. And that is all about technique. In aid climbing, a five-foot-tall person who maximizes their reach can place the next piece higher than a six-foot person who does not. You might place strings of barely bodyweight gear that will all zipper out in a fall. A marginal-looking piece will feel like a time bomb. You will be terrified that the piece might blow at any second. You will timidly step up the piece and won’t feel more confident about getting high in your Aiders and/or top-stepping. Aider bounce testing is where you put one foot in the piece you are testing while keeping the other foot on the previous piece. Another technique is to bounce on the piece using just the daisy chain. On most routes I use Aider bounce testing 80 percent of the time and daisy 20 percent. Less wear on the daisy chain. The only way to test pieces to your side. Best way to test hooks. If the piece you are testing pulls, it puts the least amount on force on the previous piece. Can generate a little more force than Aider bounce testing. In general, the bounce of each piece has three stages: light, medium, heavy. Light—Gently move onto the piece you are testing. Be ready in case the piece blows right away. Medium—Point your toe down a little lower than you heel and gently bounce a couple times. Look down. Don’t look at the piece because if it pulls it will hit you in the face. After a few bounces, stop bouncing, look at the piece to make sure it is not shifting into a bad position, and then look down again and continue bouncing. Hard—Bounce hard, harder than you think. Bounce almost to the point where you are jumping out of your Aiders. Try to pull the piece. If it blows now, you just transfer your weight to the previous piece. If it blows later, you are taking a fall of unknown size or outcome. At first, vigorous bounce testing feels counter-intuitive and scary. After all, you are aiming to get a piece to fail—something you hope won’t happen if you actually fall on lead. One mental trick I use is to convince myself I am trying to get the piece to pull out. If I am in A4 or A5 terrain and scared I occasionally resort to yelling at the piece to “Get out!” If after screaming at the piece and hard bounce testing it is still in place, I feel confident I can move up on it. 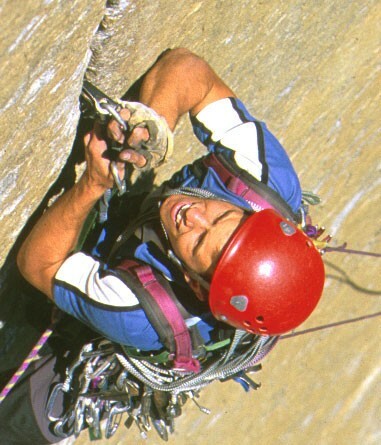 Outside Magazine called Chris one of “the world’s finest aid climbers.” He is the winner of the 1999 Bates Award from the American Alpine Club and founder of the American Safe Climbing Association, a nonprofit group that has replaced more than 5000 dangerous anchor bolts. He is a graduate of UC Berkeley and serves on the board of the ASCA and the and Rowell Legacy Committee. He has a rarely updated adventure journal, maintains BASEjumpingmovies.com, and also runs a Lake Tahoe home rental business. I climbed (and placed new bolts on the headwall bolt ladder pitch) Disco Inferno last weekend and had some concerns when bounce testing gear on the 'C1' corner on the fourth pitch. While hanging on a piece I place a small brass nut up in the crack. When bounce testing it I had the thought of the piece I'm testing blowing and me falling on the lower piece (which was also a small brass) statically because my aider is attached to it, which is then attached to me via my daisy chain. When bounce testing pieces is there a better way so if my piece blows I don't fall statically on my daisy? I started putting in my fifi hook so the fall would be shorter if it did blow but I still don't like the idea of a static fall. My advice would be test while low in the single ladder or set of aiders you are standing on. If you are bounce-testing and use a biner to clip into the daisy for the upper aider(s) You can hang on to the lower one with both hands. If the upper one pulls as well as the lower one, a daisy fall still should not come into play. So just to make sure I'm understanding what your saying. Bounce test the upper piece while holding onto the lower aider with both hands. This way if the upper piece blows you will just catch yourself. Correct? If your top stepping and placing high this isn't really an option. However, you are clipped in short with a quickdraw to the biner of the lower piece. If the upper piece blows while testing it your fall, even though static, would be short. Is this how it is usually done? What if you can't stay clipped in with the biner while stepping into the upper aider? (traversing pitch) Maybe just clip into your daisy short so you don't fall the entire length of it??? Then again, your not supposed to shock load a daisy, but what else can you do??? reduce your system to one or zero daisey's. This will allow you the ability (with one) to bounce test your upper piece, and have a dynamic catch should the upper piece blow during testing. If using zero daisey's clip upper piece, and give a few hard kicks. Fifi in if you like to give yourself a little more confidence if you feel like you're going to pitch off. Thanks for all of the replies. One last question. If your upper piece is a little questionable, do you clip the rope into the piece you are standing on? Just so if the upper one blows you don't fall all the way to the next piec down. Watching the videos, Chris never clips the piece till after he's stepped into the upper one. In response to above. Yes. But I don't do that all the time. That's for harder aid climbing. The Fish Products website has a description of a good sequence which should avoid daisy falls. Basically, Russ uses one daisy that is attached to the high piece (to prevent loss of the piece and perhaps catch you if the lower piece blows), but unclipped once he clips in with a draw from the 3rd step. However, he doesn't use the fifi hook. Using the fifi with this method could result in dropped aiders, unless you just hang onto them. If your daisies and aiders mostly stay attached, the key is to unclip the lower piece asap after committing to the upper piece. Your choice to clip the rope before or after. For most stuff I usually am attached to the lower piece with my daisy and another daisy to the upper (in case it blows it is not lost). After testing the upper I transfer my weight to it, then clip the rope through the lower piece and then unclip the lower aider/daisy. Occasionally I'll clip the rope through the lower piece before I test the upper but only in special situations. Loving it - some great tips right there !